If you follow Triple Max Tons on Twitter, you might have seen my catastrophic attempt at inventing a ramekin-sized recipe for chocolate cake. I never knew a few tablespoons of this, some teaspoons of that, and a dash of whatever could cause such an disgusting looking dessert explosion in my oven. My motive for attempting such a recipe not once but THREE times? 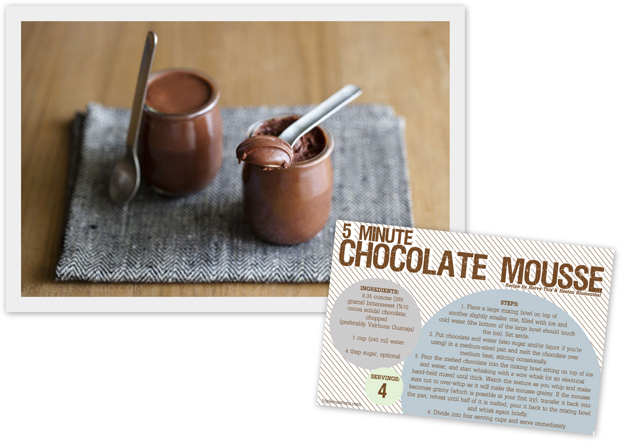 I wanted a fast and easy chocolate fix that won't make my kitchen a total disaster. I still have a long way to go to perfect that itsy bitsy chocolate cake recipe, but this 5 minute and 2 ingredient chocolate mousse seen on Cafe Fernando is looking simply sublime - and especially easy - right now! For a quick tutorial on how to make it, check out this YouTube video of Heston Blumenthal then download the recipe card I designed for this delicate and fluffy treat. 1. Enjoy this as a mousse, or use it as a cake filling. 2. Spice it up with cinnamon, cayenne pepper, crushed lavender, or a tablespoon of liquor (just subtract the amount of liquor from water if you do that option), or steep your boiled water with tea. 3. DO NOT over-whisk....watch the consistency and stop the second it thickens. If you whisk it too much, the mousse will be grainy. 4. Measurements are super critical and need to be spot on for this to work - use a kitchen scale if you have one! OMG!! that chocolate mousse is awesome! delicious! Thanks! Im following!